North Goshen Mennonite Church traces its roots to a mission Sunday School outreach begun by early Goshen College students soon after the college was established in Goshen, Indiana, in 1903. The North Goshen Mennonite Church, which was formally established in 1936 as an outpost of College Mennonite Church, can claim several historical members and church leaders, including Paul Mininger and J.C. Wenger, Bible professors at Goshen College. By 1942, North Goshen was recognized as a separate congregation with full membership in the Indiana-Michigan Conference of the Mennonite Church. Early church pastors included Paul Mininger, Russell Krabill and A. Don Augsburger. The original church building for the congregation came to North Goshen from Mt. Union, Iowa, near Wayland. Goshen College students raised the funds necessary to purchase the Beulah Baptist Church in Iowa for about $300. 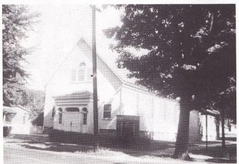 The Baptist church was dismantled, hauled by truck to Goshen, and rebuilt as a meetinghouse at the current location of the North Goshen Mennonite Church. All told, the project cost about $3,000. Later pastors have included Harvey Chupp, Art Smoker, and Dean Linsenmeyer. Over the years, assistant pastors have included Darrel Hostetler, Jerry Wittrig, Rosemary Fry, Lisa Enns-Bogoya, Marian Hostetler, and Bek Linsenmeyer. The missional focus of the North Goshen Mennonite Church has evolved over time. In the early years, college students brought Sunday School to the Appalachian immigrant factory workers who lived in the North Goshen area. The congregation then became a magnet for Amish families seeking to leave many of the strict regulations common in Amish churches in the 1950's. Our missional emphasis today has followed demographic changes in the North Goshen neighborhood as Hispanic people began arriving in the 1980's and '90's to find affordable housing and to work in the local factories. Puerto Rico. We worship God together in both English and Spanish languages. Contact us for a more detailed history of the church.